The episode leaves more questions than answers. But it serves as a troubling reminder of the immense power social-media networks wield over the political conversation in the United States, despite lingering concerns about their susceptibility to fraudulent and malicious use. Dan Lavoie, a political strategist in New York, first saw the video on Saturday, like thousands of other people who logged on to social media that day. A group of rowdy high school boys, many wearing Make America Great Again hats, had faced off with a Native American elder near the Lincoln Memorial in Washington on Friday. And the encounter, with the hallmarks of a scene in the tense reality show that is modern life in the United States — confrontation and racial animosity — was recorded by many people with phones and cameras nearby. By Saturday, Twitter’s algorithms had taken two snippets of these videos posted by random accounts and helped bring them into many people’s feeds. The tweets traveled quickly — another match thrown into the pool of anger and disenchantment that has been building up over race relations in the Donald Trump era. The videos ignited a conversation that raged throughout the holiday weekend, having leapt from social media, to newspapers and television broadcasts, and then back to social media again, and on. The debate grew as it took on layers — about whether important context had been missing from the original video (it had), whether the teens deserved such wide opprobrium (many said they did), and whether this was actually a debate between right and left — that continued with its entry on President Trump’s Twitter feed on Tuesday. The episode leaves more questions than answers, namely the identity and intentions behind the account. But it serves as a troubling reminder of the immense power social media networks wield over the political conversation in the United States, despite lingering concerns about their susceptibility to fraudulent and malicious use. The account that Twitter suspended, @2020fight, purported to be a teacher named Talia living in California. “Teacher & Advocate. Fighting for 2020,” the bio noted. It had some 40,000 followers and used, at least recently, a photo not of a schoolteacher, but an attractive woman who is a blogger in Brazil, according to CNN Business, which first reported the story. 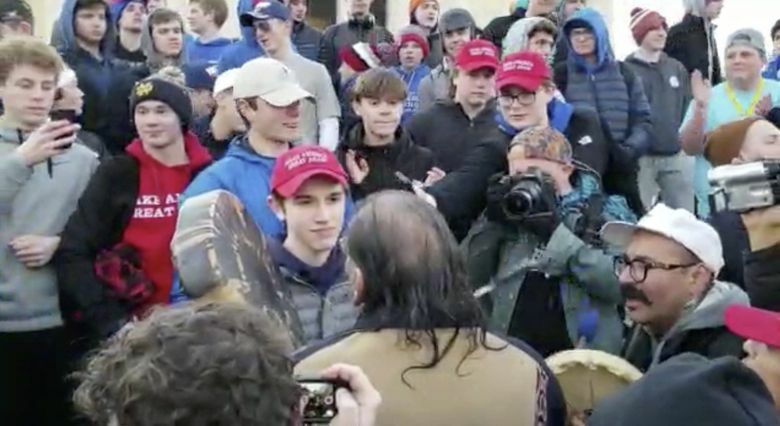 The account tweeted a snippet of the faceoff between Covington Catholic High School junior Nick Sandmann and Native American elder Nathan Phillips on Friday night, which was eventually viewed 2.5 million times, drawing tens of thousands of retweets and likes. Another tweet with video of the stare-down, shared by the anonymous account @lulu_says2 went viral as well. That tweet has since been deleted. The user @lulu_says2, whose account has not been suspended, did not reply to a request for comment sent to an email address. Another anonymous user, @Chameleon876, which positions itself as a Janet Jackson fan account, quickly posted the school where the kids were from, in reply to @2020fight’s original tweet, as well as a short narrative that purported to be from someone who was at the event. Sam Riddell, a masters student at Georgetown, said in a tweet that he had found evidence that @2020fight was available for hire on the site Shoutcart, which allows people to pay influencers to post content. If the goal was to start an argument across the country’s yawning political divide, the tweets certainly achieved it. Matthew Hindman, a media professor at George Washington University who produced a detailed report last fall about the continued prominence of suspicious accounts on Twitter, said that the company’s policy of removing tweets from suspended accounts, instead of freezing them, prevents researchers, journalists and other investigators from doing the necessary forensic work to figure out how the content was used and whether it received help from other networks of potentially suspicious accounts. Hindman said that his research indicated that the majority of tweets about inflammatory and partisan content are automated on Twitter. Hindman said that Twitter’s suspension of the @2020fight account was an indication it likely found something significantly problematic about it. Lavoie, who has seen the other videos of the incident that have since emerged, said he has complicated feelings about the whole affair. On one hand, the behavior shown on the videos was a striking demonstration of racism, white supremacy and entitlement, regardless of why they were promoted at first, he said. But, he said, it’s important to know whether the videos were being used for a vague political end — whether they were exploiting the explosive issue of race for the purposes of propaganda. Russia was identified as being behind a large-scale campaign to sow division in advance of the 2016 election through the use of hateful, misleading and divisive information spread across major social media platforms. Lavoie had previously written about the regret that he experienced after being influenced by one of the popular Facebook pages that Russia had set up as part of this effort, Blacktivist. That group too had played to resentments over racism and the treatment of minorities. On Monday, he found himself taking to Twitter again.